With picturesque views of the Yarra River, Conservatory is a beautiful setting for an evening indulging in fine foods. It's definitely worth splurging on if you enjoy fresh seafood, delicious East and West delicacies and mouth watering desserts. 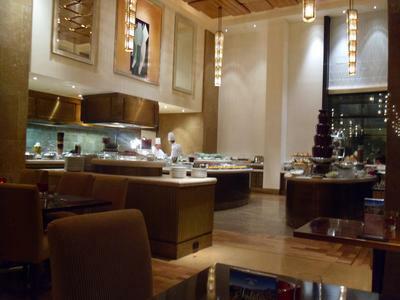 To experience a little bit of everything I'd recommend the dinner buffet for an enjoyable evening out. Dishes include fresh prawns, oysters, crab, noodles, dumplings, curried lentils, kangaroo, free-range pan fried chicken, and many other tasty options. With so much to choose from it's easy to lose count of how many servings you end up having. Although the menu caters for a variety of personal tastes, seafood lovers in particular will feel at home here. Conservatory adds a touch of class to typical buffet dining, with chefs at hand to serve and regularly bring out food, ensuring all dishes taste exceptionally fresh. The 'eat as much as you like' concept does not compensate with mediocre customer service or limited food choices like most buffet restaurants. With the option to try a traditional chocolate fountain with fruits and marshmallows, alongside exquisite cakes, Conservatory amalgamates fine dining with a fun twist. The dinner buffet is priced from $63 to $74 per person, which does not include drinks. It may be a little on the pricey side, but an evening at the Conservatory is more than just dining out, it's a culinary experience that is hard to find elsewhere. Unlike other overpriced and pretentious restaurants that offer small portions in exchange for huge bills, customers always get their moneys worth here. The décor also adds a touch of luxury, making your evening more special. Conservatory is a very popular place for birthdays and other celebrations, as the experience lives up to high expectations.